We offer timber treatments for problems such as wet rot. Wet rot occurs in timber joists, floorboards, skirting’s etc and it is quite common in older properties. The reason it occurs can be due to a damp wall adjacent to the timber, or a leaking pipe or bath waste and sometimes leaking gutters, causing water to run down the face of a building. The timber will become wet and deteriorate in its soundness and will need to be replaced. Offending timbers are cut out and replaced after the source of the problem has been rectified. Most Building Society Surveyors request a Damp & Timber report when they have found dampness in walls and Property Remedies can prepare these reports for the Surveyor normally within 48 hours if access to the property is readily available. Dry Rot initially occurs in timbers where there is dampness present and where there is a lack of air flow. Initially Mycelium is formed in root like strands which spread, and fruiting bodies are then formed which are red in appearance and these start to cover timber and walls. The red dust that they produce will spread through the air to other parts of the property. The strength of the timbers is considerably reduced as the very life in them has been drawn out. 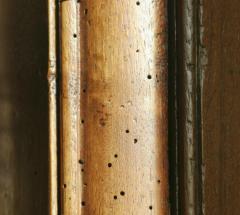 Action needs to be taken quickly as Dry Rot can spread very fast to other parts of the property with a similar effect. Property Remedies will carry out a Free Survey and within 48 hours provide you with a Report and Quotation. Woodworm as it commonly known as an attack by wood-boring insects on timber joists, floor boarding, skirting’s, doors, architraves, door casings and furniture. Attacks to under roof areas are also common, eggs are laid inside the timber and within 3 years will hatch and surface thus providing the multi-holed timbers. In some instances, the timbers are so badly eaten that they have no strength and will drop in pieces. Property Remedies can treat this problem with Dual Purpose Timber treatment and replacement timbers where required. We will carry out a Free Survey and prepare a Report and Quotation with 48 hours. 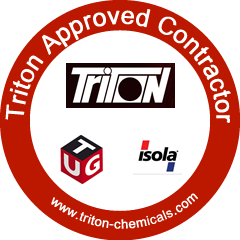 Property Remedies are approved contractors for Triton Systems and as such we are able to offer the insurance backed Triton Guarantee.